Jay Gowda, President/ CEO and go-to guy at Audio Communications Home Theater in Pittsburgh, Pennsylvania. While the majority of Jay's work is in new homes and commercial venues still requires pulling lots of new cables, he relies on MoCA technology in his retrofit jobs to deliver Ethernet connections wherever they are needed. Jay Gowda is a great example of the many ESCs who use a mix of residential and commercial work to diversify their revenue streams as insurance against downturns in any single market. 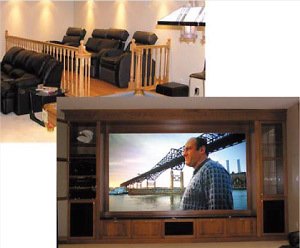 Jay's company, Audio Communications Home Theater, specializes in integrated home and commercial systems that often combine building automation with whole-house audio and advanced distributed video systems. One of Audio Communications' signature products is distributed video systems that connect the feeds from centrally located set-top boxes, media players, and media servers to any screen or set of speakers in the building. These systems are very popular in large homes and commercial buildings, which can easily have 10-20 screens and nearly as many places wired for pro-quality audio. In these environments, the fees for maintaining a separate cable box for each screen can quickly run up a bill of $1000 or more a month. Centralized content distribution systems like those Jay installs can cut a home owner's or club operator's cable bills dramatically, allowing them to pay for themselves in under a year. While the majority of Jay's work is in new homes and commercial venues which still require pulling lots of new cables, he relies on MoCA® technology in his retrofit jobs to deliver Ethernet connections wherever they are needed. Jay appreciates the way it cuts the average time required to create an Ethernet run in a finished home from a minimum of 3 hours to less than one hour, and his customers appreciate the fact that the process does not require making any new holes in their walls. MoCA technology provides Jay a quick, cost- effective upgrade path to full streaming HD IP–based entertainment systems for clubs and sports bars upgrading to HD from analog based entertainment systems. Jay also discovered that MoCA Certified products come in handy for solving the odd problems that often pop up with his commercial clients, such as adding Internet access to a high-tech garage that one of his clients located next to his main facility. The steel-sided outbuilding houses a fleet maintenance operation and a customer lounge area which Jay had already wired for cable a few years back. The owner contacted Jay again when he realized he needed Ethernet connections for several new office computers and to provide an Internet connection for the computerized diagnostic equipment he planned to install. Adding MoCA transceivers to both ends of the 200' cable run made it easy of Jay to tap into the main building's Ethernet system but it also let him add a few extra custom features to the job at little extra cost. While it was not in the original job spec, Jay used the new IP connection to extend the main building's Control4® system to the iPod® dock located in the company gym, creating a "free" media server for the entire facility. Jay also put MoCA technology to the test when he was called in to add Ethernet jacks to the classrooms of a local church. Since there existed Internet service for the office area on the other side of the building, the parish had tried using a Wi-Fi® access point but walls of the '70's-era concrete structure just sucked up the signal. The same sturdy walls and the lack of a basement made running any new cables to the classrooms so difficult that one contractor suggested digging a trench around the outside of the building. Once the Audio Communications team arrived it did not take long for them to discover that the classrooms were already wired for video feeds, allowing them to quickly drop in a few MoCA adapters and a VLAN- enabled router to keep the classrooms' network isolated from the church's office computers. While nobody's nominated Jay for sainthood yet, the time and expense that he saved by using MoCA technology made him a small-time hero with the congregation.